I like the water lily pond on the left picture. It feels like a very harmonious combination of Cha Xi and nature. But it's not just beautiful to see, the accessories are chosen to fit the tea perfectly. On the right hand picture, my friend uses a white Japanese Obi belt (for kimono) to create a long, white 'flow' -almost a river-. 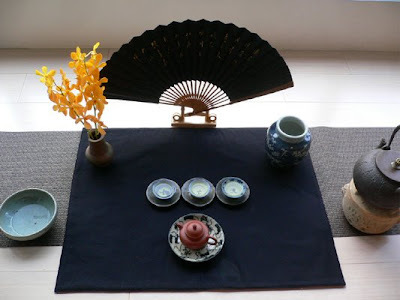 In Teaparker's second article, we can see how these other tea students use fine, long bamboo mats as background of their Cha Xi. 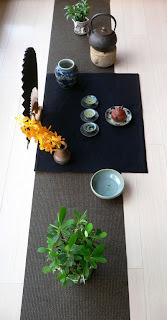 I brought something similar from my last tea trip: a 3 meters long woven mat made of dried grass. You can see how I use it here on a Qing dynasty styled Cha Xi, drinking this winter's Feng Huang Hung Shui Oolong with my zhuni Duo Qio. There are no limits to tea, to passion or to creativity. This gives us boundless possibilities to enjoy our finest leaves in so many wonderful ways. It's all up to you, how you feel and how you'd like to feel! And, interestingly, the more we focus beforehand on the tea we intend to brew, the better it often becomes. So, make it happen. Brew with style, with passion and with understanding. 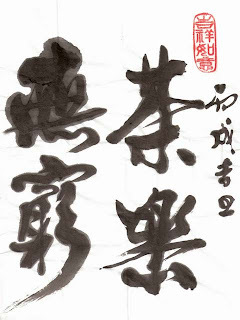 (The calligraphy says: 'Tea Passion, no limits'! I've shown it before). Update: Teaparker posted 2 more articles about the tea party. Here, he shows a Cha Xi innovation: using plexiglass to give a modern, light and transparent feeling. And in this article, he shows a stunning picture of the water lily pond Cha Xi. Does it also remind you of Monet? tout ce que je lis ici me réjouis ! cette liberté et cette créativité au service du thé ... beaucoup de sensibilité, de finesse et d'informations , c'est beau. Your post in informative and lots of creative works. I really enjoy reading it and write to express my sincere to the blogger. Et, je rappelle en passant que tu avais d'ailleurs gagné ce concours de créativité l'an dernier! Thank you for your feedback James.